Call It What You May … Alcohol Awareness Card … Alcohol Education Card … Drink Card … But There’s Only One TAM Card! – TAM Card® Nation in Vegas! Call It What You May … Alcohol Awareness Card … Alcohol Education Card … Drink Card … But There’s Only One TAM Card! Did you know that Nevada is one of only 18 states with mandatory alcohol awareness training required for service professionals? (Alcohol Policy Information System). Training classes and drink cards are required here for just about anyone who deals with the sale of alcohol on the job. It is important for service professionals to know the basics of the laws governing the training that they are required to take. A business can face serious fines for not complying with alcohol education laws, so making sure your training is legit, and that you’re in compliance, is crucial. Service professionals often have a list of common concerns. Is my awareness program state-approved and does the training delivery and content meet state requirements? How often do I have to renew my card? And, taking it a step further, how do other states handle liquor sale laws and training? We’re happy to spill all the details! In comparison with the rest of the United States, Nevada has relatively liberal alcohol laws. According to Wikipedia, “bars are permitted to remain open 24 hours, with no “last call”. Liquor stores, convenience stores and supermarkets may also sell alcohol 24 hours per day, and may sell beer, wine and spirits.” Local governments in Nevada may have more restrictive regulations than the state. Additionally, Nevada is one of only 10 states that does not impose dram shop liability – what that means is that a service professional or business that over-serves an intoxicated person cannot be held liable if that person injures themselves or someone else after leaving the bar. (Marin Institute). To compare and contrast Nevada’s laws regarding alcohol sales and service with those around the country, you can refer to this chart supplied by Wikipedia. Laws vary greatly not only by state, but sometimes from county to county, so a server should always be aware of the regulations where they are working or planning to work. TAM® provides you the scoop on the local regs whether you work in Clark County or in Sparks. Given the liberal laws mentioned above, Nevada made a decision to ensure service professionals act as the gatekeepers to sales and service. Nevada’s approach ensures that a well-educated server is familiar with alcohol’s effects on the body and can recognize the dangerous signs of over-intoxication. Just because you cannot legally be held liable for over serving someone, does not mean that you are not morally responsible if someone gets killed or injured. Furthermore, a responsible server knows when to refuse a sale, and that can be one of the most important steps to preventing alcohol-related accidents and fatalities. You wouldn’t want your pharmacist to not be trained in the medications he prescribes you, so why not apply the same thought process to a bartender? Alcohol is a regulated substance too; those who dispense it should be trained about its effects. Alcohol Awareness Training is required in Nevada Counties with a population of 400,000 or more for almost all service professionals. You can refer to the Nevada Legislature website to read the laws, and for details on who is governed by them. The Nevada Commission on Postsecondary Education is the agency charged with approving and regulating schools to provide alcohol awareness training. You should ALWAYS check with the Commission to see if a program you are considering is approved, a list of approved programs is available on their website. For additional statistics and information on what to look for in a training program, you can read our blog post, “Did You Know That In Nevada Alcohol Education Cards Expire After Four Years?” For more information on beverage service training programs regulated around the country, you can refer to the Alcohol Policy Information System provided by the NIAAA. 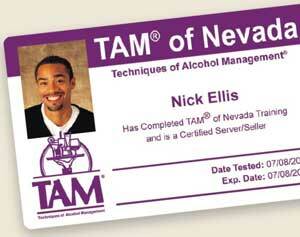 There are several providers out there of credible and effective alcohol awareness training, but TAM® of Nevada is the only authorized provider of the TAM card®. TAM® of Nevada has been an approved provider of alcohol awareness education and a provider of alcohol education cards for more than 25 years, and we hope to continue educating Nevada’s sales professionals for a long time to come! Are you compliant with Nevada’s alcohol and hospitality laws? Do you think Nevada should be doing more to regulate sales and service? Pingback: Can’t Make It To An Alcohol Awareness Class? TAM® of Nevada Offers Online Training! | TAM® Nation in Vegas! Pingback: Anatomy of a TAM Card® – Find Out If You Are At Risk by Not Having An Official TAM® Card | TAM® Nation in Vegas! Pingback: Are You Serving Alcohol Lawfully? TAM® Cards Expire After 4 Years | TAM® Nation in Vegas!